We have partnered with United Community Bank Ice On Main to host Below Zero With Heroes, an event honoring active military members and veterans. 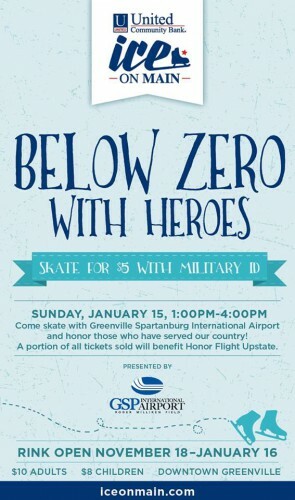 Please join us this Sunday, January 15, from 1-4 p.m., where a portion of the ticket sales will go to Honor Flight Upstate, SC. Anyone with a military I.D. may skate for $5. Since 2008, Honor Flight of the Upstate has been committed to flying over 1200 veterans to Washington, DC. To honor and support our nation’s heroes, this organization flies veterans out to the nation’s capital to see memorials built in their honor, and to experience recognition for their service. 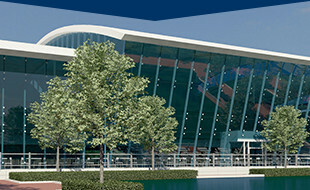 Visit http://www.honorflightupstatesc.com/2011/ to learn more. We hope to see you this Sunday, January 15 to support an amazing cause!